If early spring is about growing things and new life, then it’s also about looking over one shoulder back at winter’s scarcity and hard earth. It was snowing only weeks (days?) ago. Months shy of summertime abundance, there is still an economy to our cooking. When there's lamb, it's crucial none of it goes to waste, so we find ways to coax tenderness and goodness out of its most cartilaginous cuts. Lamb ribs don’t have the glamour of a crown roast or a whole splendid leg, but! They might secretly be the very best part of the animal. In our convenient and seasonless world, we order tenderloin after tenderloin and don’t bother anymore with the difficult cuts, which is why you won’t see lamb ribs shrink-wrapped in grocery stores, and why you might need to order them special from your butcher. Hewn from the breast, they’re typically sold in racks, though faster to cook when separated into individual riblets. As with any cut that’s ribboned with fat and connective tissue, they need to be salted overnight to tenderize the proteins, then cooked for hours, at low temperatures, so the fat renders until molten. I like these ribs coated with a crunch of spices, even if they remain lodged in my teeth afterwards. 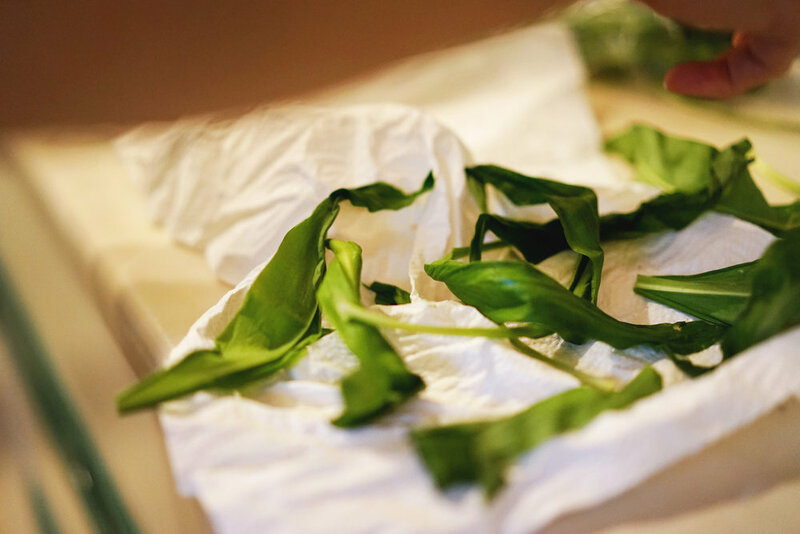 They’re finished off with a yogurt sauce made with ramps (or wild garlic, as the pungent plants are known in the UK), another ephemeral Spring signifier. As you eat them, between wiping slicks of fat off your chin with the back of your hand, reach for a glass of Saison. I’m thinking in particular of Saisons with funk and strangeness, Saisons with a sense of place. If lamb, at its gamiest, can taste like paddocks and earth and animal, then Saisons can, too. You want one of those, one with some tartness and astringency to help temper the unabashed fattiness of these ribs, one that could almost roll around in the dirt. Burning Sky Saison Anniversaire is just the type, and also a product of the spring. Based in a barn in rural Sussex, just miles from the English Channel, Burning Sky makes IPAs and Stouts, of course, but is best known for mixed-fermentation beers of delirious complexity. Founded only in 2013, it was the the first modern brewery in the country to use oak foudres, and the first since the 1930s to acquire a coolship, which it installed early last year. Its Saison Anniversaire is an achievement, a beer to return to. It’s brewed while the weather is still temperate, aged for a year in Chardonnay barrels, allowed to referment in the bottle, and then released in time for the brewery’s September birthday. It is vinous and quenchingly tart. But elegance works best when it’s just sheathing something visceral, and so underneath its refinement are hints of all that wildness. 1. Begin the night before you plan to serve your ribs. Arrange on your cutting board or work surface and season the riblets generously with sea salt and freshly ground black pepper. Flip the ribs and ensure the reverse is also seasoned. Add to a large Ziploc bag and pour in the olive oil and fish sauce. Seal tightly and move around gently with your hands to help the ingredients mingle. Chill overnight. 2. One hour before you plan to start cooking, remove the ribs from the fridge so they can come to room temperature. Preheat the oven to 250°F (120°C). Line a large baking sheet with foil and place a wire rack on top. 3. In a spice grinder, add the cumin seeds, coriander seeds, fennel seeds, and Sichuan peppercorns, and pulse until roughly ground. Open the bag with the lamb ribs and pour the ground spices in. Reseal tightly and move around with your hands to ensure each rib is well-coated. 4. 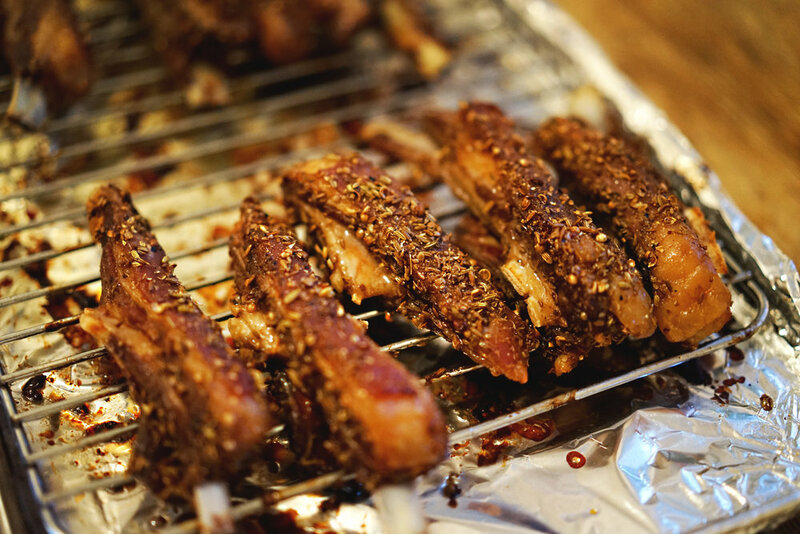 Arrange the ribs on the wire rack over the baking sheet, leaving a small amount of space between each. Tent with foil and slow-roast for 3-3 ½ hours. When fully cooked, the ribs should be golden on the outside, their meat should be tender and not tough, and their fat should have rendered so it’s melting, not chewy. 5. Shortly before the ribs are ready to come out of the oven, prepare the herb yogurt sauce. In the bowl of a food processor, add the ramps, mint, cilantro, lemon zest, salt, sugar, and olive oil. Blend on high, pausing to scrape down the sides with a spatula, until the mixture resembles a pesto. 6. Add the yogurt or labneh to a medium bowl. Slowly whisk in the herb mixture. Season to taste. Serve alongside the ribs.